The science and technology of interacting surfaces and movable relative to one another. Includes friction, wear and lubrication process, that is, the unity of the lubricant and the environment. The 25% world production of energy is lost through friction. This amount of energy would be sufficient to meet the full energy needs of Europe. Oil additives can reduce the friction, so your car will become more fuel efficient. In recent decades, scientists and technicians pay more and more attention to reducing friction losses. From the beginning of the 90s have been developed the third generation of METABOND oil additives – metal surface finisher – product range that is suitable for reduce 60% of frictional losses in full compliance with the highest environmental standards too. If an extreme load induced, the oil film between the two surfaces is interrupted, the mixed friction is created, where certain parts of the two metal surfaces are free of lubricant, sopieces will secede from the surface and goes to the lubricant. The oil filters can handle with this pieces for a while, but it is impossible to completely eliminate them, so as the emery, there will be more wear inside of your machine. In the 1950s, 60s lubrication technicians tried to use oil additives to create a protective film on the metal surface in the event of interruption of the lubricant.These first generation oil additives were generally lubricant with Teflon or metal organic-based products, what the war industry began to use. Only disadvantage was the foreign surface what was applied non-laboratory conditions exfoliate after a while. Today’s precision-manufactured engines, high-tech, these fragments can cause serious disorders. Of course, this does not mean that these oil additives what was used in laboratory conditions does not work effectively, it simply means that the post-treatment was not always the expected positive results.Their use requires expertise and well-worn mechanical equipment. For new vehicles due to the growth surface is not recommended. By contrast of our metal surface finisher, using Metabond additives is not associated with impaired growth, thus it is used for new cars as well. In the 70′s the research was intended to further development of lubricants and oil additives. After the first attempts seemed more and more to improve the quality of lubricating oils to achieve significantly better results, than the first-generation anti-friction products.Using different additives that load can be increased, whereupon the oil film is broken and pressed out from the surfaces, resulting in deterioration triggering mixed friction. The engine oil is not only responsible for reducing the friction. 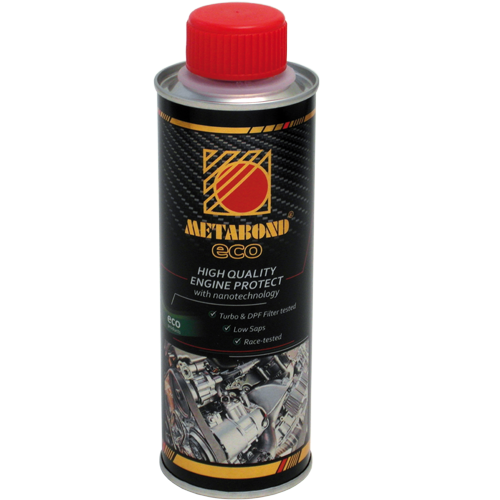 Protection against wear of pump ability, high and low temperature stability, resistance to oxidation, the sludge and deposits prevent the gasket with compatibility, corrosion protection, good heat dissipation, the miscibility with other oils are all important features of the today’s engine oils.The aforementioned requirement can be met if the base oils blended additives to improve oil resultant properties. Modern motor oils are composed of base oils and additives balance. If you have any additives, in this case the friction reduction was overdosing, can upset the balance and that expectations of oil will no longer meet the other direction. Therefore, the oil producers keep aloof to the use of additives. In contrast, METABOND products are not oil additives, not affected by either chemical lubricants or physical properties, the oil is only that medium which carries the METABOND to the metal. Most car owners know that engine oil can not be filled any kind of oil, but with the proper selection of oil are often uncertain about the professionals. The important feature of the oil pump ability, at cold start to get along the oil inside the engine. German experts have created a transparent plexiglass cylinder head engine, and they measure the amount of time to get sufficient quantity oil from the sump to the valves. Cheap and medium-grade oils, this time is between 10 to 17 seconds, while racing oils 6-10 seconds. The upper part of the engine is working during this time without lubrication and if no metal surface finisher treated it will be damaged. Another test was conducted, two of the same type of new car was tested, they run them 1000km (620mi) daily on a dynamometer. The first car was started once, the other run 100km(62mi) ten times, but it was left to cool down between 2 run. One hundred days, so 100,000km(62,000mi) after the first car engine abrasion index was 10%, while the second engine was 40%. If Metabond additives was used in the car the abrasion index does not exceed 10%. The main characteristic of the third generation additives of the new approach to the problem of friction side. Not affect the lube either physical or chemical properties, does not create growth, it is metal surface finisher, thereby ensuring the ideal conditions for lubricating oils. 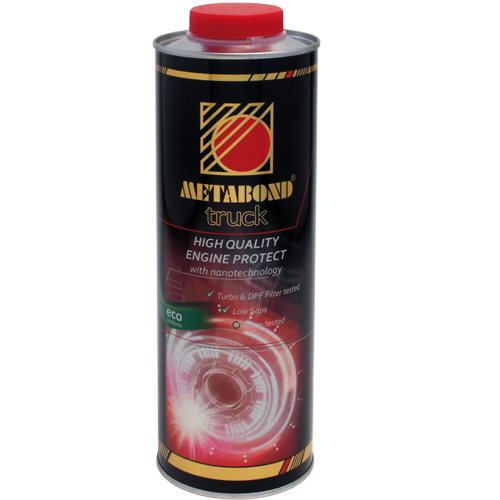 For example, using the METABOND additives up to 60% friction reduction is achieved by offering additional benefits. Promises significant efficiency increase, thus the energy consumption is greatly reduced. In industrial use of Metabond additives, the vibrations and the environmental noise can be significantly reduced. Our future and present one of the biggest problems of the pollutiob, which is greatly reduced by the use of METABOND additives. The amount of residual oil is reduced by half, because the lubricating oils lose their lubricating ability due to the ideal conditions much later. The internal combustion engine due to smoother surfaces the fitting is improved, so reduce leakage of oil into the combustion chamber, resulting in exhaust of toxic substances concentrations decrease. Their use does not require expertise, simply mix the lubricating oil with the additives, preferably occasion of oil change. The key elements of the third-generation anti-friction additives products spread after the 91′s Frankfurt motor show. The only motorsport tested METABOND products fair grand prize, after a Ferrari applied with additives new world record has been set up. The Ferrari factory is still using our additives in their engine, along with other automakers. In order for industrial users also benefit from the beneficial effect of friction reduction for a whole range of products to create was needed. Starting from the third generation of Lubricant funds entirely new product line dedicated to the industry and everyday users.